Take that scowl off your face, bro. Yes, you read that headline correctly. Powerlifters need to train more like bodybuilders. But I’m not saying that because Powerlifting University wanted an article that would get more clicks and cause a hullabaloo online. You’re strong. You’re not enraged Hulk slamming a god into the ground strong, but you’re a beast. And you want to be more beastly, right? The more muscle you carry around, the more beastastic you’ll look. Now, aesthetics may not be your thing, and that’s totally cool. But there is a reason why you want to carry more muscle mass. Bigger muscles are stronger muscles. And powerlifting is a game of strength. So tell me again why you’re not chasing bigger muscles? By not spending time training like a bodybuilder, you’re leaving muscle gains and strength potential on the table. And when you leave that on the table, you’re also leaving your chances of taking home top prize on the table. I won’t promise you that if you train like a bodybuilder for six months that you’ll come back to the platform and set all kinds of records. But I also won’t tell you that that might not happen either. Still, there are some things that no matter how you train you may never be able to overcome. And understanding these limitations can help you better understand how to go about following a hypertrophy program so that you leave nothing on the table. “It’s my genetics,” is an asinine excuse. And you’ve heard friends or family members say it before. But it does have some relevance. There are things that no matter how much you try, you cannot change. For instance, you can’t change where your muscles insert on your body. And the closer your muscles are to the joints they insert at, the weaker you’ll be; that means the further away your muscles are to their insertion points, you’ll be more suited to lift heavier weights. Of course, there are a lot of factors here that you have no direct control over. We don’t live in the world of Gattaca where your parents can use genetic selection to make sure you’re a freak beast in the gym. Wait, why doesn’t that exist yet? Someone get Jeff Bezos on that, stat. Anyway, there’s nothing you can do about the structure of your pelvis or the length of your torso. And there is nothing you can do about where your muscles insert to your pelvis, humerus, or any other joint. So you can change the skeleton your muscles move around every day. But you can change your muscles, right? Yes and no. Your genetics may predisposition you to walk around with more type 1 or type 2 muscle fibers. Meaning that if you have more type 1, you’re gonna have higher levels of endurance, and if you have more type 2 fibers (ideally type 2b for strength athletes) you’ll exhibit more power and explosiveness. Again, you have both types of muscles in your body. And you can train to build more of one or the other depending on how you exercise. But it is “possible” that you may be coming in slightly handicapped here. You may not be able to directly change the amount of types of muscle fibers you have. But you can change the size of your muscles. The Art of Hypertrophy . Those are all colloquial ways to say: “You sir are a massive mound of muscles.” And when you look at some of the strongest lifters on Earth, next to none of them are small. Many of them are gargantuan beasts. But there’s something we need to clear up first. For too many years, there seemed to be this, we’ll call it “myth,” floating around that bodybuilders were weak. And that if you trained like one, you too would get weak. That’s crap. Total crap. Now, that doesn’t mean that some bodybuilders might have been weaker than, say, a powerlifter who had “smaller” physique. And that may be true in some cases. But for the most part, bodybuilders are pretty effing strong. Arnold held impressive PRs for lifts back in his day. He Cleaned and Pressed over 240 pounds; benched over 400; squatted over 500; and deadlifted over 700. So bodybuilders are by no means, weak. And there have been numerous bodybuilders who have decided to step off the stage and become powerlifters who have gained massive amounts of strength and set records in no part thanks to their muscle mass. Simply put: larger muscles are stronger muscles. And the more muscle mass you can put on, the more potential strength you have sitting on your frame. Now, I know what you’re thinking. Progressive overload dictates that if you continue to gain more strength by lifting heavier weights that your body will adapt and build muscle. And that is true. But at some point, to continue pushing muscle growth, you’re gonna have to turn up the volume. You could do that by hitting more sets of the weight you already lift, sets of 1-5 reps. But the problem with increasing volume with those high intensities is that you’re setting yourself up for inadequate recovery, and you’re raising your chance of injury. Or my friend, you lower the weight and increase your reps and train more like a bodybuilder. This will a few things: you’ll recover quicker and faster and feel more pumped to train more often; training more often means that you can create more muscle damage and force more growth; you’ll give your joints and CNS a break; you can create more mind muscle connection and better recruit your prime mover muscles for your big lifts. You may already be using some hypertrophy exercises in your training right now. You hit your main lifts — squat, bench, deadlift — and then you add in some 3-4 sets of accessory movements for 8-12 reps. And most powerlifting coaches program this way and believe in the effectiveness of this ideology. But I’m going to break with standard wisdom here and say that you should take 12 weeks off of direct powerlifting training and spend that time adding as much mass you can. Train for three months as a bodybuilder and increase your muscle size. By doing this, you’ll create more potential strength which will benefit you in the long term. Here’s a template you can use to build an amazing 6-8 week hypertrophy focused program so that you can add more potential strength to your frame. Maximizing muscle growth—aka taking home the best trophy of all, hypertrophy—won’t happen if you neglect training with moderate volume and higher reps. Focusing primarily on only hitting your max strength, and not spending time training like a bodybuilder, will hamper your strength potential in the long run. 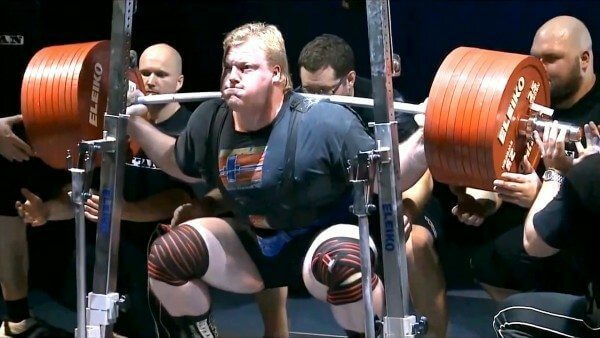 Taking a few months off of heavy training might sound counterintuitive to a powerlifter like yourself. But by building bigger muscle you’ll increase not only your muscle mass but the motor units needed to make that muscle fire. And the more muscle you can activate, means the more muscle you can use to hoist heavier weights. The more weight you can lift, the more likely you are to continue getting stronger and stronger over time. And who doesn’t want to take home more trophies? Robbie is a soulless ginger who helps men (and women) in their 30's look and feel better than ever.